The youth vote, coveted by political parties during this past election period, came into focus when the Independent Electoral Commission (IEC) announced the final results from Wednesday’s general elections on Saturday 9 May. 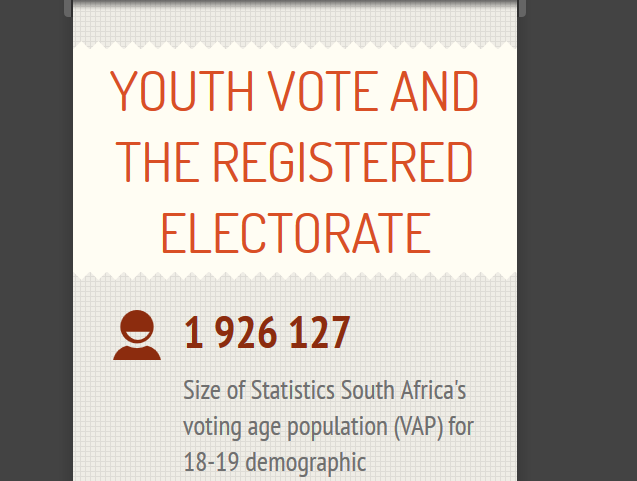 The IEC recorded in November 2013 that the 18-19 age group only comprised 0.72% of the total voting age population (VAP) and the group only took a 6.12% share of the overall total of registered voters. Source: IEC data, Census 2011 figures, and Elections 2014 votes breakdown. Michael O’Donovan, analyst with Multi-level Government Initiative (MGI), weighed in via email with his comment on the data above to provide context. “When the data is analysed at provincial level, the DA proportion of votes tends to decline as the yuth proportion of the population increases. The only excption to that trend is Gauteng where the DA got a higher proportion of the votes than would be expected given that provinces age profile,” O’Donovan said. He added that the trend is reversed with EFF. Where the population had a greater number of youth voters, the higher the probability that the party won. “There are two exceptions to that trend, namely KwaZulu-Natal and Mpumlanga. In both these areas, the ANC did particularly well. The ANC’s good performance in these provinces is due largely to the increased support they got from communities in “traditional areas”. This suggests that cultural aspects tended to dominate voting trends more than “youth” perspectives did,” O’Donovan continued. The data suggests that there is no clear relationship between the EFF and the proportion of the youth population with no education. It seems then that the youth are somewhat more inclined to vote for the EFF, irrespective of their education level.